If you want to watch the waves, smell the sea, and be only a short stroll from restaurants, shops and coffee you’ve found your slice of heaven at Sand Dollar Escape. This warm and welcoming home has west facing windows so you can enjoy watching the ocean from any spot in the living room or the dining room. With a wide open floor plan this house and plenty of room to spread out and relax in. 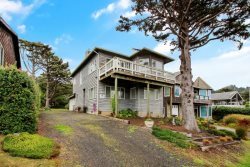 Sand Dollar Escape is both levels of the duplex and this home will sleep 12 people. If you have a smaller group please look at Sand Dollar which is the top level of the duplex. The home has 6 bedrooms and4 bathrooms. Each level has a master suite has a king bed and attached private bath. There are two bedrooms, one on each level, that have queen beds. The fifth bedroom is upstairs and has a bunk bed with a double bed below the twin bed above that’s perfect for the little sailors in your group. And the sixth bedroom is downstairs and has a bunk bed with a pull out trundle below with a mermaid theme that and coordinates with the downstairs hall bathroom. For even more convenience there are two full laundry rooms, one on each level. But the biggest amenity of Sand Dollar is the ocean side deck and the patio below. The deck is the perfect spot for morning coffee or a glass of wine while watching the sun set. The patio below is shared with the house next door.